Facebook Offers have been around since 2012, allowing brands to distribute coupons to users for special promotions. However, they never really took off like many of Facebook’s advertising features. The social network is trying to turn that around by improving Offers to make it easier for people to find, save, and redeem coupons, especially from mobile phones. The changes also make it easier for brands to control who sees and uses their coupons. Offers have always functioned by distributing online and in-store coupons as ads or organic Page posts that link to a brand’s site. When a person clicks the ad or post, they were then emailed a copy of the coupon. 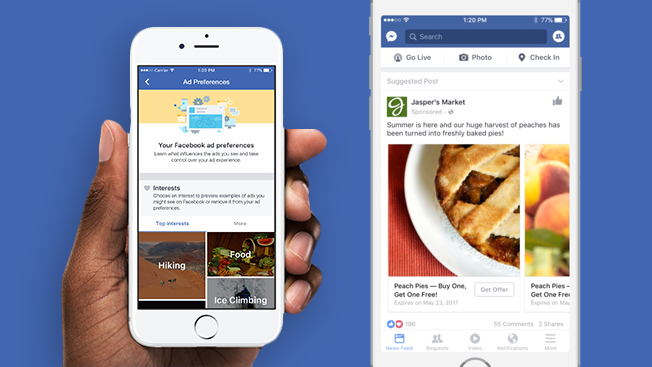 Facebook has streamlined and integrated the feature more thoroughly into their platform. While users can still click on Offers to visit the advertiser’s site and redeem their coupon via email. However, now offers will also be saved to a new Offers bookmark tab linked to their account. This way, customers can quickly and easily access their coupons through Facebook’s mobile app and cashiers can easily scan the promotional barcode on their phone. Also, Offer codes will be shown at the bottom of the screen when users travel to an advertiser’s site to immediately redeem the code. That means they don’t have to exit the app to open their email, making the process less convoluted for users. Not only is Facebook trying to make Offers easier to use and more attractive to users, the company is working to make sure those who show interest but don’t immediately redeem coupons don’t forget about you. When a saved offer gets close to expiring, Facebook will alert users to let them know time is running out to get savings. On top of all of this, Facebook is making it easier for users to find Offers shared by brands with a new Offers tab on brand Pages. Offers shared organically by brands are still available to anyone who sees it in their feed, however, Facebook is improving targeting for offer-carrying ads with more ad-targeting options. These including selecting people in your customer database to offer loyalty promotions or targeting similar individuals based on their characteristics. 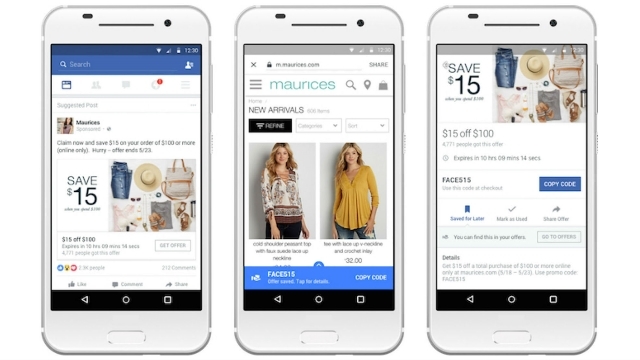 According to media reported Tim Peterson, Facebook is working on expanding their Offer targeting options for brands even further, but it is unclear when those improvements can be expected. For now, Offers are getting a big shot in the arm that will make them more attractive to users and more effective for brands who use them. Has your brand or business been using large pop-ups to gather email addresses or asking people to like you on Facebook? You might be in trouble with Google if you don’t change your site soon. Google has announced it will begin to penalize sites with intrusive pop-ups or interstitials starting January 10, 2017. As Google defines them, intrusive interstitials are pop-ups that block the main content on a screen until an action is taken. While this can be an effective way to ask visitors to take action, most people find these annoying because it serves as a roadblock before they are able to see what they came to see. For the moment, Google is just singling out interstitials on mobile devices and devaluing search rankings for mobile results. It is unclear if they intend to extend this to desktop in the future. The change to Google’s algorithms specifically targets pages with interstitials that either pop-up immediately when a person lands on a page or is triggered by scrolling down the page. It was also devalue sites which use oversized above-the-fold content to look like an interstitial. There are some exemptions to Google’s interstitial rules. Pages with “reasonable” banners that don’t take up excessive amounts of screen space will be considered acceptable. Also, sites that are required to use interstitials for legal reasons – such as cookie usage or age verification – will be exempt from ranking devaluation. The latest change shouldn’t come as a complete surprise. 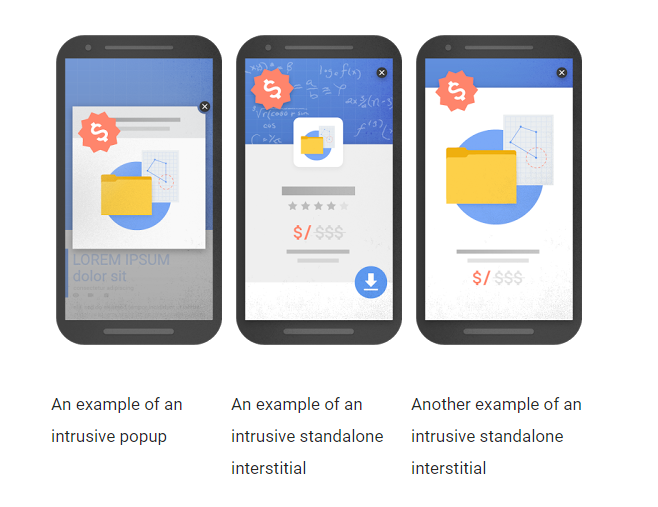 Google has already cracked down on one form of interstitials in the past by devaluing pages with interstitials that prompt users to install a mobile app. According to the company’s announcement, their work into that algorithm change showed the company they also needed to tackle interstitials as a whole. As with all algorithm changes, the new guidelines for interstitials don’t automatically mean death for your online traffic if you are using interstitials. If your site is still highly relevant for a search, it may still appear in the top results. However, it is usually better to err on the side of caution with Google, rather than face the risk of a penalty. Early this year, Google took advantage of the US Presidential election to test a new feature allowing candidates to publish messages straight to the front page of search results. Then, in March, the company expanded this test to include a tiny number of small businesses. Now, Google is widening their tests yet again – increasing from “tens” of small business to “thousands”. Even more, the company is taking the feature international with tests in Brazil and India, as Google confirmed to Mike Blumenthal this week. 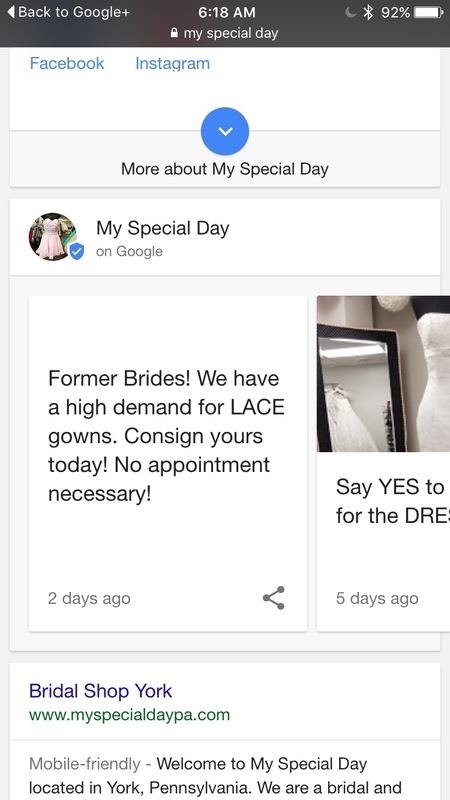 The feature allows small businesses to create cards with short messages that appear on the front page of search results pages similarly to AMP articles or social media cards. It appears that the cards show up specifically on searches for an exact business’s name. The cards can also include text, links, pictures, and even videos. Reports indicate businesses given access to the test can use a dedicated app to post content, but the public will have to wait to see. 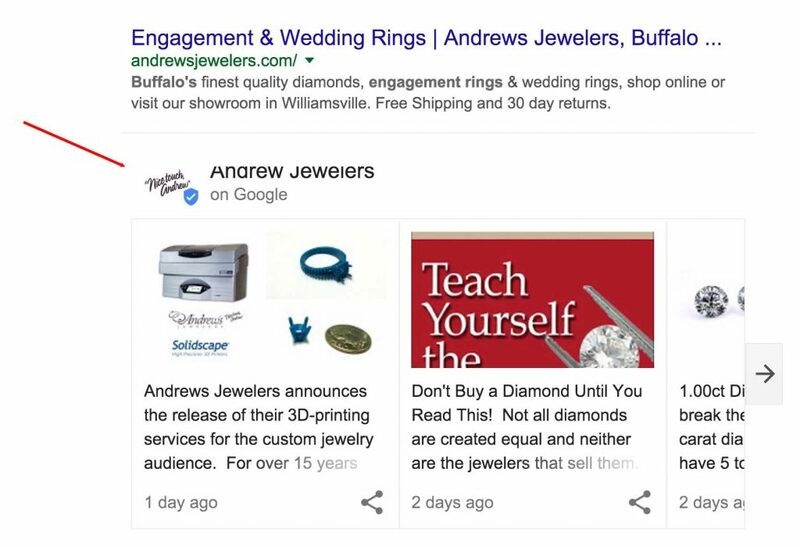 According to Blumenthal, you can expect to see more of these cards showing up in search results over the next 30 days as Google finishes rolling out the test to businesses. Instagram is still typically thought of as a niche social platform. But, with over 300 million daily active users and counting, the Facebook-owned app is far from a scrappy upstart. It’s a hugely popular platform that is still being overlooked by advertisers and brands. Brands that incorporate Instagram into their social media strategy have been shown to receive high levels of engagement and brand awareness. Even more, the platform has been shown to be a powerful lead generation tool. These aren’t the only reasons your brand could benefit from being on Instagram. In fact, Buzzoid compiled 22 reasons you should consider the platform into a stylish infographic. Check it out below, or at Buzzoid’s site. Earlier this year, Twitter rolled out a new feature known as #Stickers that let users add searchable emoji to their photos posted on the social platform. Since then, Twitter says millions of photos containing #Stickers have been tweeted and shared around the world. Initially, the emoji available for these “virtual hashtags” were limited to the options Twitter created. However, the site is starting to open the door to allow brands to create their own #Stickers as an ad type called Promoted Stickers. 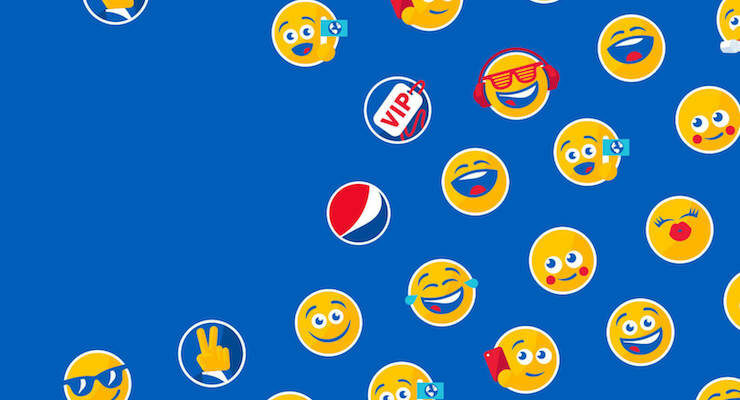 Pepsi is the first brand to use Promoted Stickers, with 50 custom “#PepsiMoji”rolling out to 10 countries, including the USA, Canada, Mexico, Argentina, and Russia. The stickers are part of a larger “Say It With Pepsi” campaign and can be found in the Twitter #Stickers library. Since Twitter is initially keeping the Promoted Stickers limited to a select number of brands and managed accounts, it is unclear how much they cost or what tools may be available to help create new branded stickers. It is also unclear when or if the social platform plans to expand the service to more brands in the near future. Taylor Ball https://www.tulsamarketingonline.com/wp-content/uploads/2018/07/TMO-Logo.png Taylor Ball2016-08-18 13:24:462016-08-18 13:24:46Twitter Lets Select Brands Create Their Own Searchable Emoji "#Stickers"
Pinterest is continuing to bulk up its ad platform by allowing advertisers to now buy ads based on how much they want to pay for impressions, the company announced today. In the past, advertisers were only allowed to choose how much they wanted to pay for engagement. Along with the new way to purchase ads, Pinterest has also added frequency capping to their ad services. This latest move continues Pinterest’s trend of expanding their advertising offerings to bring in more businesses. Earlier this year, the company increased the number of targeting options for ads. They have also made Buyable Pins available to users on all devices, including desktop. While advertisers have been able to bid for how much they are willing to pay for engagement, Pinterest’s CPM-based ads were only available at fixed prices until now. These prices typically ranged between $30 and $40. Those prices should go down as the new bidding process will increase competition. The feature is just rolling out, but already JCPenney, The Home Depot, and General Mills are running tests with the new CPM-based ads. The new ads are already available for all business in the U.S, UK, and Canada. More countries are expected to come in the future. Your Google My Business Page is the epicenter of all your local online marketing for your brand or business. Now, Google is making it easier to see how users find your GMB page with enhanced insights that show where your visitors are coming from. The biggest question the new insights help answer is where your GMB page visitors are coming from. Specifically, are they coming from Google Maps or Google Search? With enhanced insights, you can now see a simple breakdown of how many visitors are coming from each source straight from your GMB dashboard. 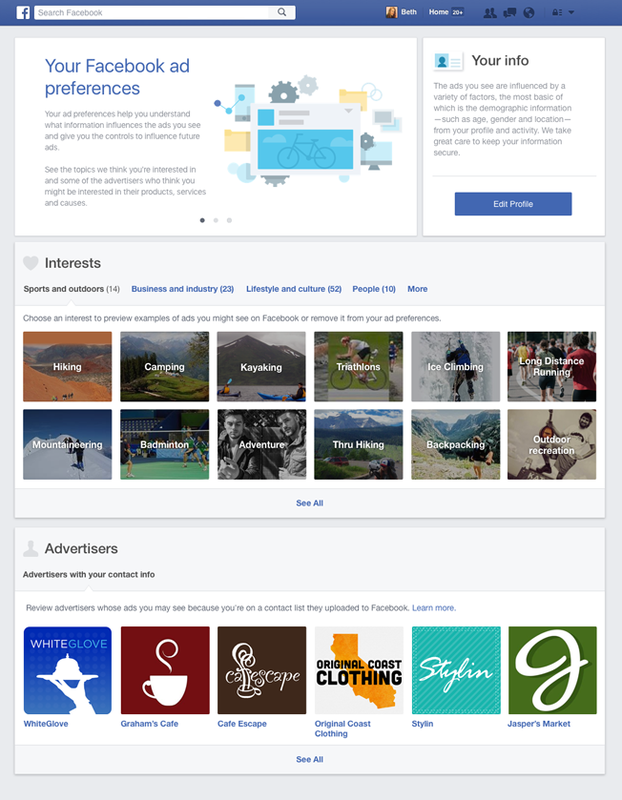 The new insights also help you understand how people are finding your page. Some may be searching directly for your brand or business name, but others are likely to find you by searching for a related keyword. You can now view a comparison of who found your page by searching for your name and who searched for a related keyword. Don’t expect to be able to see which keywords they were searching for, however. Those are currently ‘not provided’. While these new insights are being added, Google is also removing the Google+ statistics from the GBD dashboard. Facebook operates one of the largest ad services on the internet and they claim they have finally figured out how to beat ad blockers with two new changes to their ad platform. To start, the company has announced they have created a way to get past ad blocking extensions on desktop to show ads to everyone who visits their site – even if they don’t want to see them. The company was unwilling to say how they have accomplished this, but most likely they have created a way to ‘cloak’ their ads so they are not able to be targeted and blocked by popular ad blockers. While Facebook is blocking ad blockers on desktop devices only, they are most likely working to do the same on mobile in the near future. To compensate for this, Facebook is trying to make sure the ads users see are more relevant and useful to their lives by giving new control over what ads are shown in their news feeds. The new ad control tool was released today and lets users add or remove interests from an “ad preferences” list to show what topics they are most interested in. “When they’re relevant and well-made, ads can be useful, by helping us find new products and services and introducing us to new experiences—like an ad that shows you your favorite band is coming to town or an amazing airline deal to a tropical vacation,” Andrew Bosworth, VP of ads and business platform for Facebook, wrote in a blog post. “But because ads don’t always work this way, many people have started avoiding certain websites or apps, or using ad blocking software, to stop seeing bad ads. These have been the best options to date. To help refine their ad service, Facebook commissioned research firm Ipsos MORI to survey users from around the world to determine why users are ad blockers have become so popular. The majority of those surveyed said the main reason they started using ad blockers was because advertising often disrupted their browsing experience. The hope of the new changes to Facebook’s advertising service is that giving people more control will make users more interested in the ads their shown and provide a more seamless browsing experience. While many will complain about the move to thwart ad blocking software, the ability to choose what you’re shown will hopefully make the change easier to swallow. We can all pretty much agree clickbait is the worst. There’s nothing as annoying as clicking a misleading headline only to be taken to a poorly made website, usually covered in ads, and filled with bad copy. Thankfully, Facebook is trying to put an end to clickbait with new changes to their ranking algorithm. After reviewing tens of thousands of articles and headlines, a team at Facebook built a system they believe will block huge amounts of clickbait by targeting common phrases. According to Facebook, the system works similarly to an email spam filter but for the News Feed. The social network specifically defines clickbait as headlines that withhold information or exaggerate to create misleading expectations. That means headlines like “You’ll Never Believe Who Tripped and Fell on the Red Carpet or “Apples are Actually Bad For You? !” won’t be able to cheaply rack up clicks. For most Facebook brands and publishers, this is good news. You won’t have to compete with sites that use cheap methods to rack up clicks and shares without creating compelling content. However, if you’ve been using clickbaity headlines, you may be in for trouble. In the coming weeks, brands that are guilty of using clickbait will see their news feed visibility decrease substantially. If you want to avoid this, Facebook says to put more effort into your headlines and share content people want to read. This isn’t the first time Facebook has taken efforts against clickbait. Back in 2014, the company released a similar update designed to cut out clickbait by measuring how long people stayed on a site before returning to Facebook. It also compared click-through rate and engagement rate to determine if content was actually high-quality.